It might be cold outside (well, not THAT cold, it’s actually pretty nice for January! ), but it is the perfect time to start planning for the growing season! 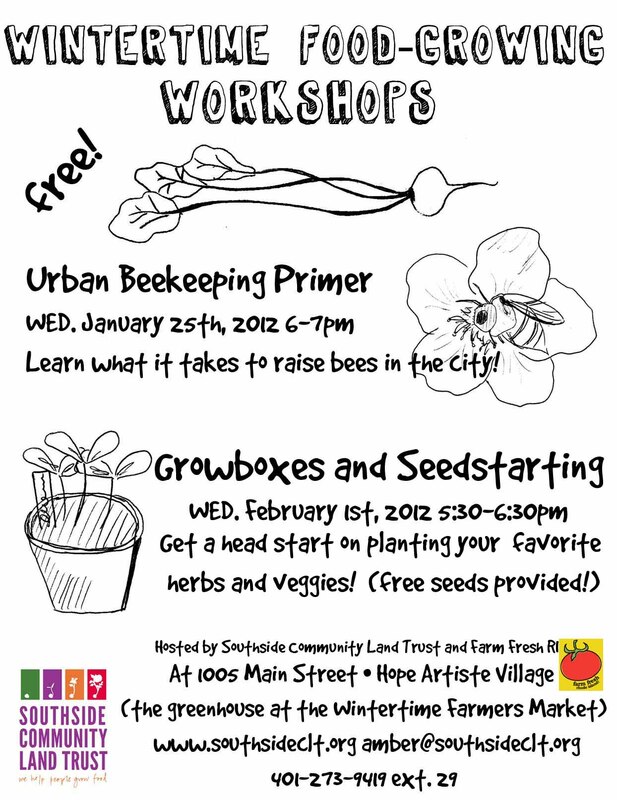 Southside Community Land Trust and Farm Fresh RI invites the public to attend two free workshops on urban beekeeping (a primer that focuses on what it takes to raise bees food in the city) and seed starting. These workshops will be held at the Wintertime Farmers Market greenhouse space on Wednesday January 25th 6-7pm and Wednesday February 1st 5:30-6:30pm, respectively. Want to learn what it takes to raise bees in the city? Learn more about it at the urban beekeeping primer workshop, which will be taught by Kelly Smith, Davis Park Community Garden coordinator. Kelly owns 5 beehives and has taken bee school classes and a week-long intensive advanced course by the Eastern Apicultural Society. Kelly will give a basic overview about what it means to keep bees in the city, going over topics such as materials required for urban beekeeping, resources and available education options for bee school. Seed starting will be taught by Sidewalk Ends Farm’s Laura Brown-Lavoie, Tess Brown-Lavoie and Fay Strongin. This workshop will help people get a head start on preparing their favorite vegetables and herbs as well as accommodate for those who have limited growing space in their homes or apartments. The lesson will also provide information on growing sprouts and building your own indoor grow box to start seeds inside. Southside Community Land Trust will be offering free seed packets (lettuce, summer squash, etc.) at this workshop. Register by emailing SCLT at amber@southsideclt.org or online at www.plantprovidence.org. These workshops are an extension of the Plant Providence educational workshop series. First introduced in 2010, the Plant Providence calendar is a full-color poster printed annually that lists programs and events taking place throughout the year related to urban agriculture. In addition to the upcoming workshops on urban beekeeping and seed starting, the 2012 Plant Providence calendar will debut at Southside Community Land Trust’s Urban Agriculture Kick-off on March 3rd at the Roger Williams Park Botanical Center from 1-4pm. The Plant Providence calendar is a project of Southside Community Land Trust and is sponsored by the Albin Family Foundation, the Urban Agriculture Task Force of Providence, Brown University’s Center for Environmental Studies, Casa Buena Builders Inc., the John T. Howard Agency Farm Family Insurance, The University of Rhode Island Outreach Center, What Grows On in Rhode Island, and Whole Foods Market.